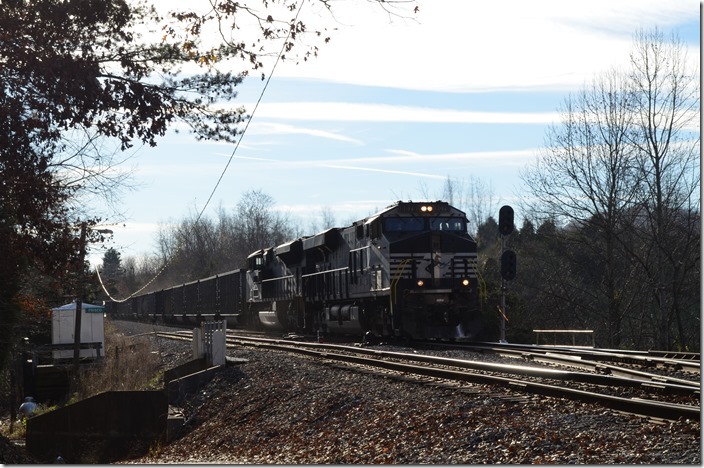 After photographing CSX’s annual “Santa Train” at Carfax VA, I heard the NS Clinch Valley dispatcher give the go-ahead to a southbound coal train to head through the connection between Boody and St. Paul. 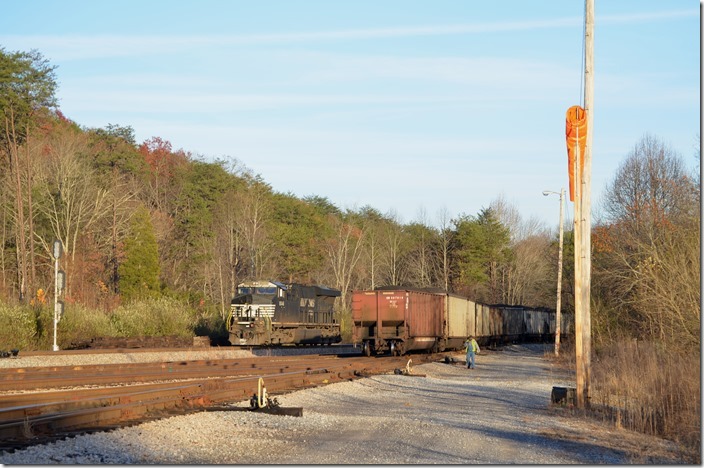 After the shut-down of the former Clinchfield to through traffic, only NS trains operate over that portion of the Kingsport SD between St. Paul and Frisco TN. 1. NS 9733-7289-8695 are s/b on the Kingsport SD at St. Paul with 778-17. 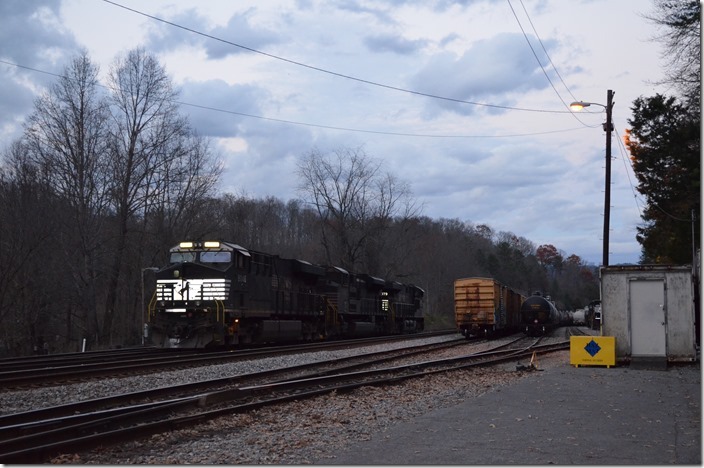 This train loaded on the former Monongahela Ry. at Murray Energy’s Monongalia County Mine (formerly Consol’s Blacksville 2 mine). 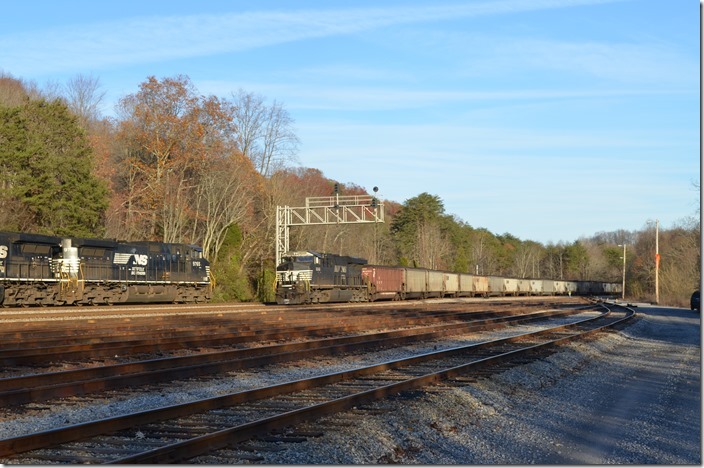 The 98 NDYX loads were destined for Duke Energy’s Asheville Plant at Skyland NC. St Paul. 2. NS 9733-7289-8695. View 2. St Paul. 3. I raced on south to Frisco TN for a shot of the “Santa Train” perhaps for the last time. While waiting, a NS train went westbound (really east direction) behind three units. 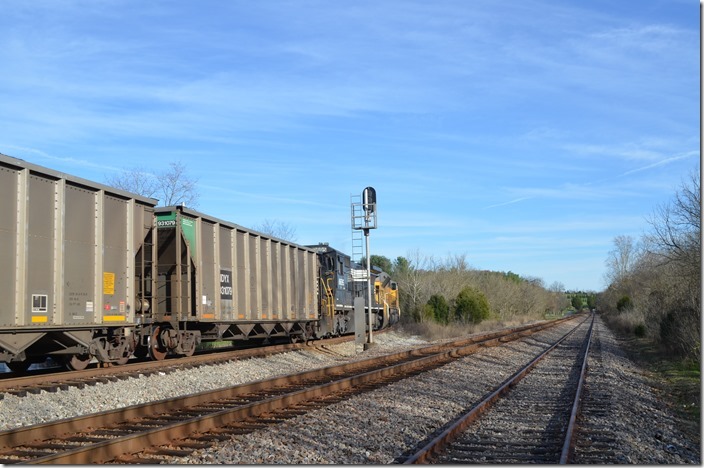 This train was composed of a bunch of system boxcars followed by a bunch of system coal hoppers (more on this later). I wasn’t monitoring the NS channels at the time, so I didn’t get the train number. NS 778-17 wasn’t far behind CSX P907, and he was approaching the connection track at Waycross as the last of the Santa crowd were dispersing. NS 9733-7289-8695. View 3. St Paul. 4. NS 778-17 approaches the switch to the “New Connection” that will lead it back to NS rails. NS 9733-7289-8695. Waycross TN. 5. NS 9733-7289-8695. View 2. Waycross TN. 6. 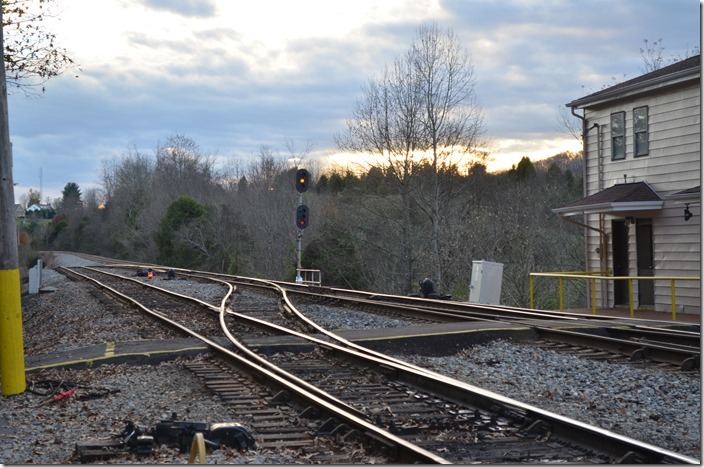 The CSX Kingsport SD and passing siding are on the right looking south. No. 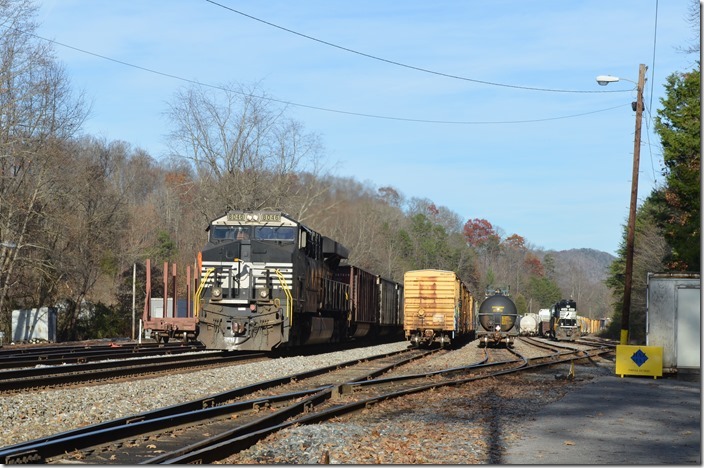 778-17 will loop back over CSX and head southwest toward Bulls Gap TN on the former Southern. NS 9733. Waycross TN. 7. 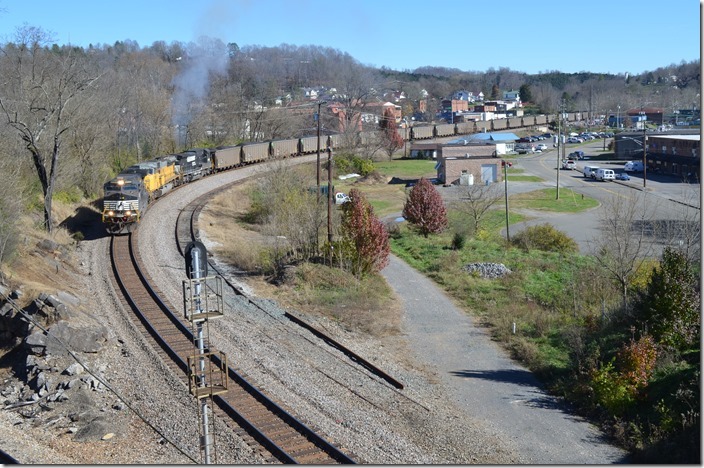 The crew run for 778 is Carbo VA to Bulls Gap TN. No. 778 probably travelled via Brownsville PA, Shire Oaks, Pittsburgh, Conway, Alliance, OH, Crestline, Bucyrus, Marion, Columbus, Williamson, WV, Iaeger, Cedar Bluff, VA to Carbo. These were tracks of the former MGA, PRR and N&W before reaching the former Southern at Frisco. 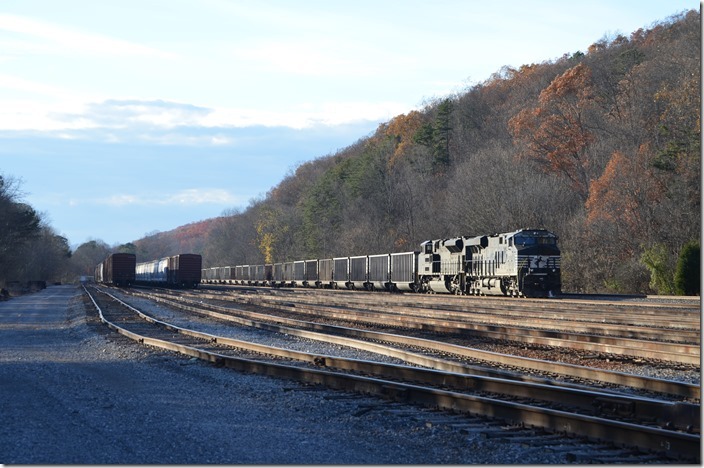 Don’t be astonished...coal on CSX was coming from the same area also. NS 9733. View 2. Waycross TN. 8. 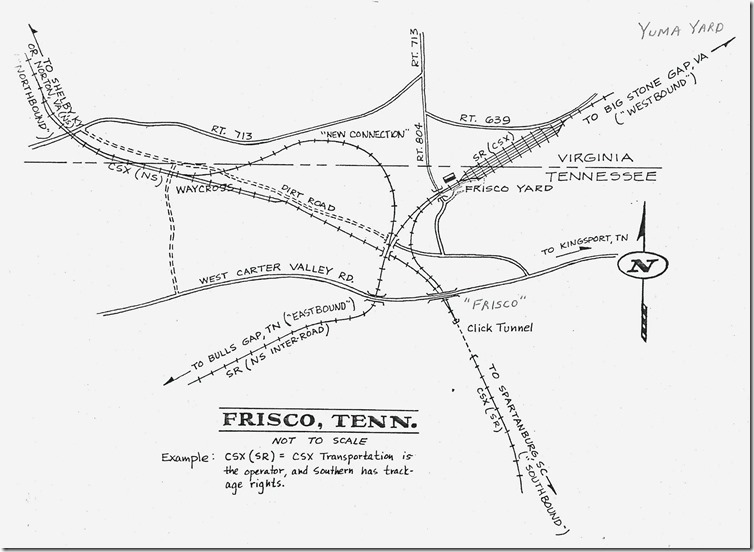 Ron Flanary drew this excellent map to help understand the Frisco area. 9. 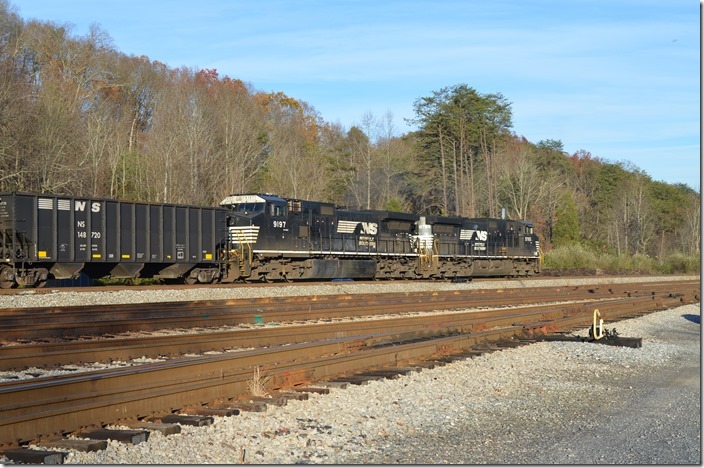 NS 8079-1039 with coal train 72K-21 thunders by Frisco with 95 loads. 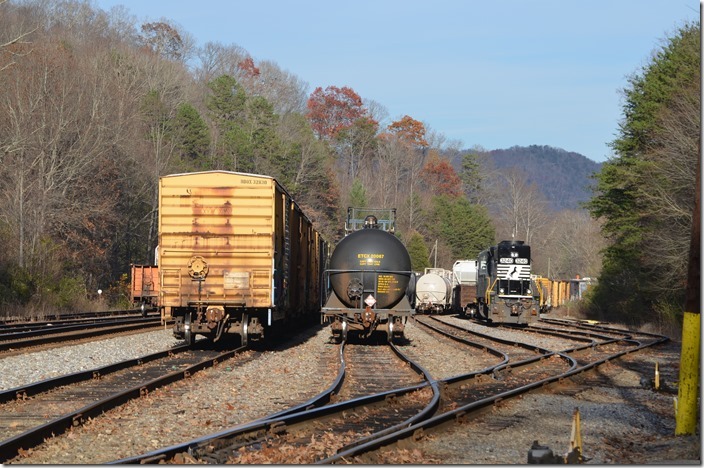 This train had loaded at Paramount and Burley KY and was destined for Eastman Chemical at Kingsport. Paramount is essentially Appollo Fuels on the outskirts of Middlesboro KY, and I presume “Burley” must be a siding nearby. I can’t find “Burley” in any of the maps, car-loadings bulletins, or mine directories. Frisco TN. 10. DPU 9046 rolls by at track speed. 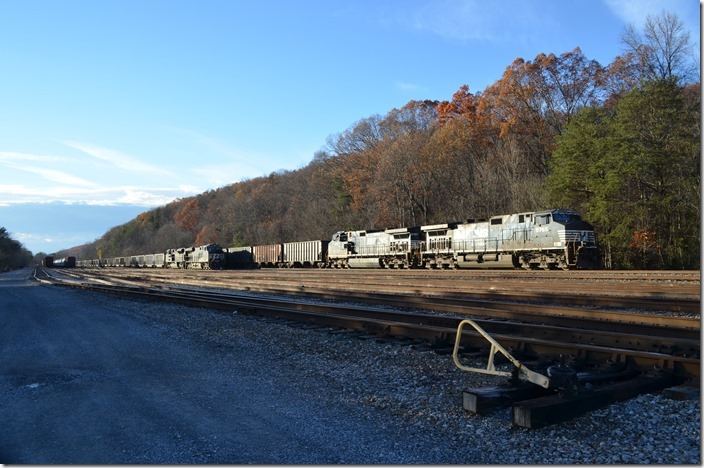 SD40-2 3240 is parked on the right in the small yard. 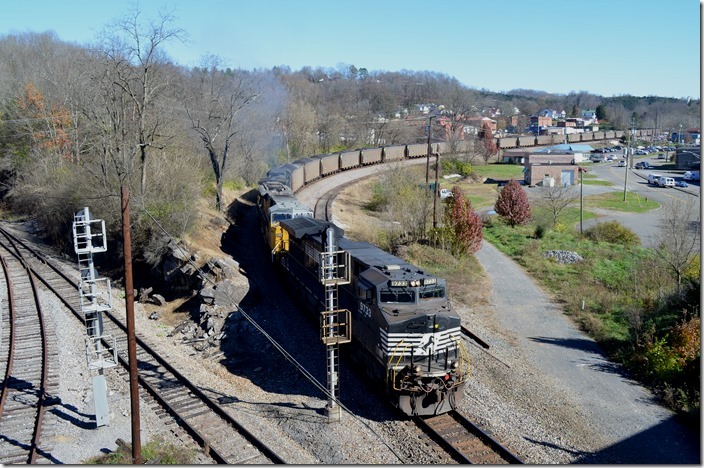 At this time I had no idea why a coal train would be going west on the Appalachia District toward the Southwest Virginia coal field. Also remember that on Southern and NS the direction from Bulls Gap to Andover is westbound, although it is geographically east. Confusing! NS DPU 8046 3240. Frisco TN. 12. NS Frisco Yard Office looking westbound toward Andover. Frisco TN. 13. 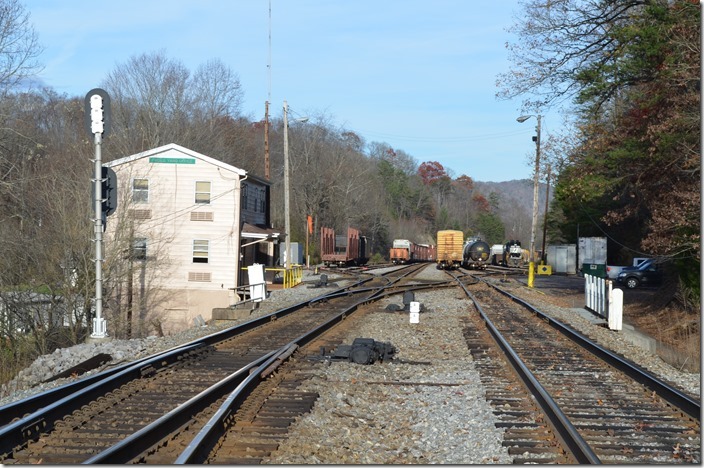 Crews go on duty here to switch Kingsport, but there isn’t a clerk, yardmaster, or operator anymore. The “OSS” in Atlanta keeps up with the set-offs and pick-ups these days. 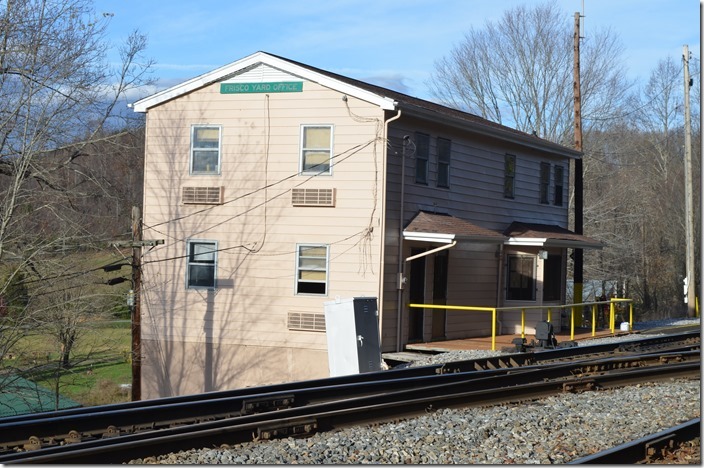 NS yard office. View 2. Frisco TN. 14. NS 3240. Frisco TN. 15. Yuma Yard is in Virginia about three miles west of Frisco. It was used more for coal storage than general freight. 72K-21 pulls to a stop on the passing siding. NS 8079-1039. Yuma VA.
16. NS 9765-9197 backs down the main at “Smith”, the signal at the west end of Yuma Yard. Yuma VA.
17. 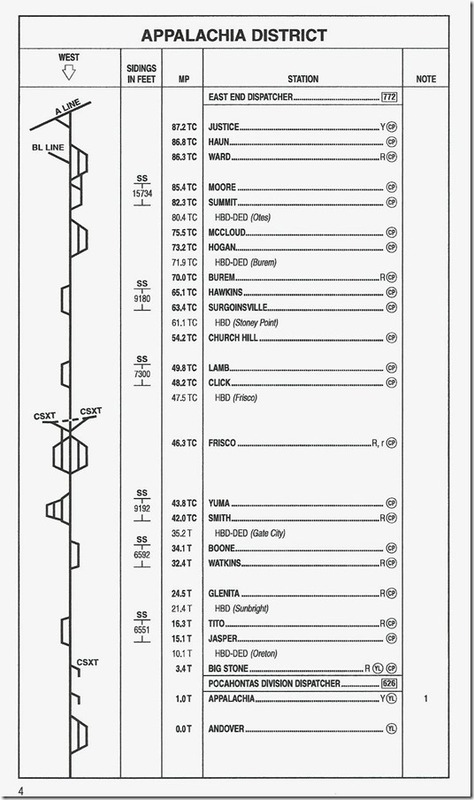 On the scanner I was hearing the “K-train” (72K), local T08 and freight 387. 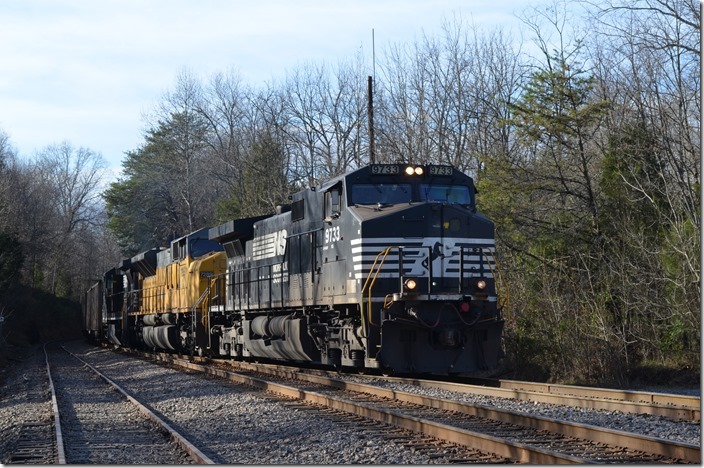 I’ve learned that 9765-9197 were on westbound freight 387-21 (Knoxville-Andover). This was the train seen earlier while waiting on the Santa Train. 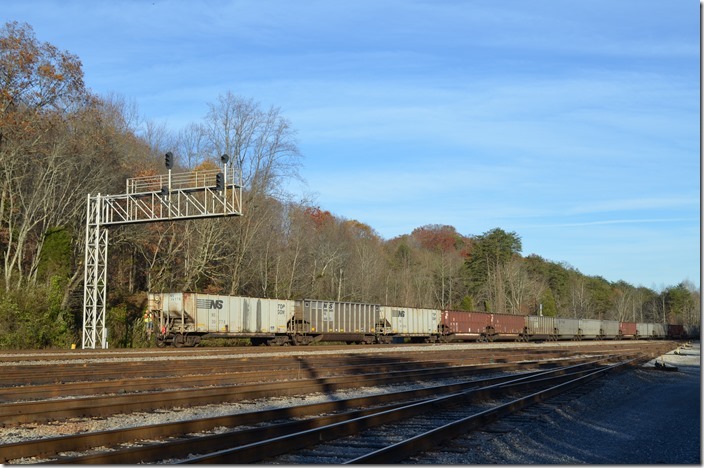 Nineteen of those boxcars on the head end were inbound wood pulp or cardboard from Rayonier in Rosser GA for Eastman Chemical in Kingsport. These were set off at Frisco. I have no idea what this material is used for. Evidently one “motor” was set off also. NS 9765-9197. Yuma VA.
18. 387 picked up more empty coal cars at Yuma and arrived Andover with 95. NS 9765 8079. Yuma VA.
19. The “K-train” now pulls ahead at “Smith” and sets the DPU over in a vacant track before shoving its coal train into Yuma Yard. NS 9765 8046. Yuma VA.
20. NS 8046 DPU. Yuma VA.
21. 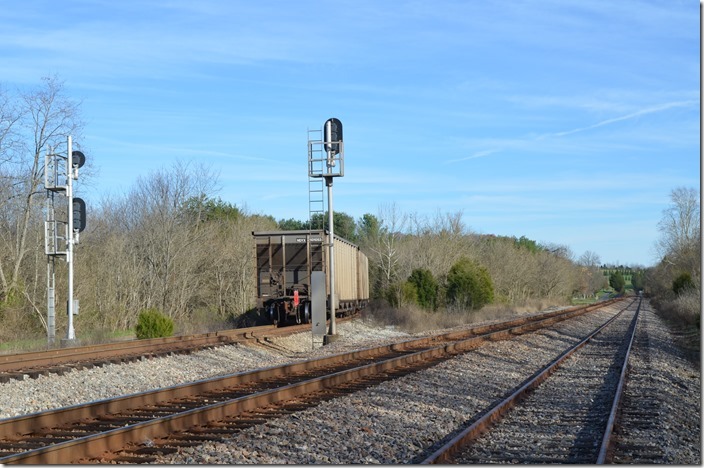 This NS approach signal at Frisco reveals that 72K is coming back east to tie up his engines. 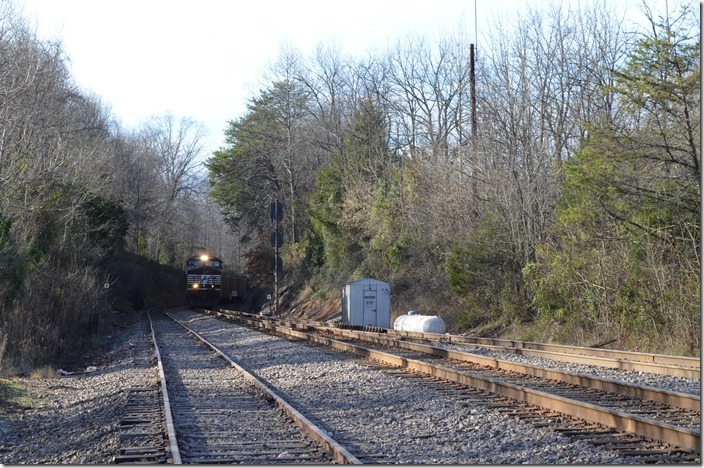 The track leading off down the hill to the left is the connection to the Clinchfield which NS uses to access Kingsport via trackage rights. Frisco TN. 22. NS 8079-1039-8046. Frisco TN. 23. NS 8079-1039-8046. Frisco TN. It is getting dark by now. 72K-21’s power is parked at Frisco. 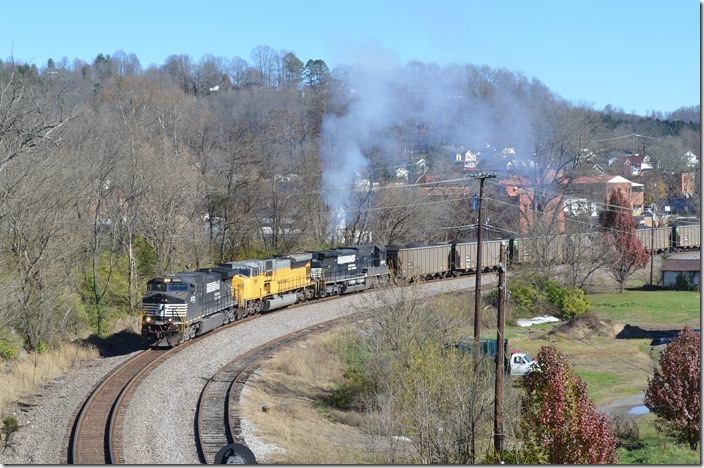 Local T08-21 (Frisco-Yuma Local) used 3350-6118 to take 50 loads off 72K to Kingsport. I didn’t see this train. 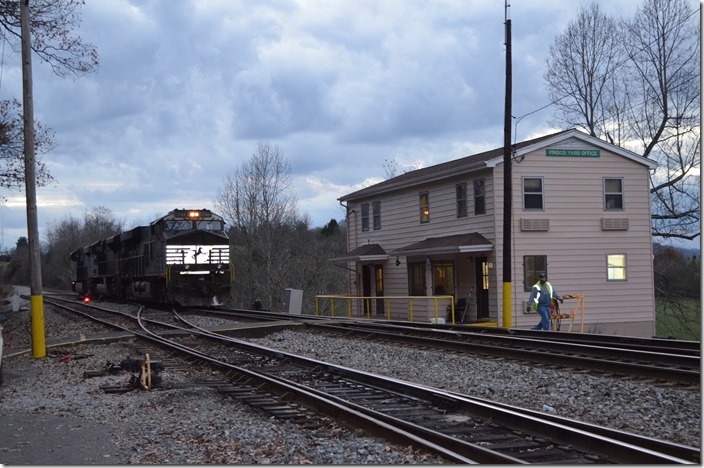 This ended an eventful Saturday on CSX and NS.